To my bridal couples, I will always remember each and every wonderful wedding I’ve ever videotaped, edited and successfully presented to 98% of my clients. The unhappy 2% taught me to value their opinions and experiences thereby making me reach even higher. Unfortunately, after 17 years my body has convinced me to take a slightly different creative path thereby retiring from the videotaping side of the business altogether. 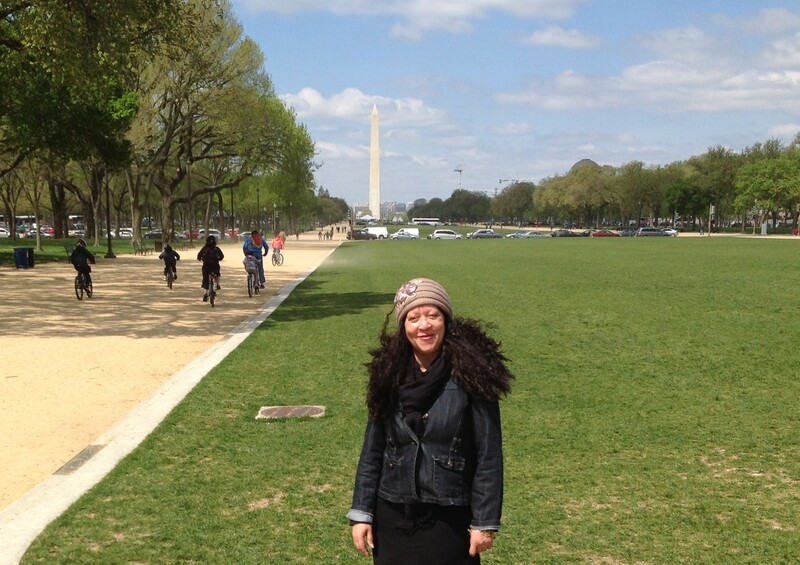 It’s my hope that you join me on my new journey on my A. Celeste Sheffey Blog Page. Transitioning from videotaping and editing weddings to designing wedding day memories, into fabulous home decor has been an exciting career change. For instance, consider that you can ‘Customize your bathroom decor with unique shower curtains designs. Made from 100% polyester our designer shower curtains are printed in the USA and feature a 12 button-hole top for simple hanging. The easy care material allows for machine wash and dry maintenance. Curtain rod, shower curtain liner and hooks not included. Dimensions are 71 inches. by 74 inches’. Inspiration for this shower curtain came from a photograph, I took with my cellphone, of my daughter-in-law’s gorgeous shades of pink and white wedding bouquet. Adding a tapestry effect made the end result more of a Fine Art piece . Imagine a colorful curtain as the focal point of their new bathroom decor. Visualize something similar in your home or for a friend’s housewarming gift. They will be amazed and you will score a major win! Quite often the groom and groomsmen wear suits that can be worn after the wedding day celebration. Wouldn’t you like to make their suits extra special by including colors coordinated with your wedding theme! We excitedly sold twenty of these rich, winter red tie design to a bride for her December wedding. Please use our contact form below to begin the fun in designing your wedding neckties. View the various shades of one of my favorite colors – purple that Sheila chose to use throughout her wedding day accents. I love the purple wedding shoes with the diamond accents. The bouquet is absolutely stunning with all of the rich purples, lavendars, deep plums and delicate mauves. My assistant, Tiffany and I continue to love working with all of Wedding Khoncepts bridal couples by videotaping each wedding day with an eye for capturing elegant photographic images. These video still images are the super aren’t they! 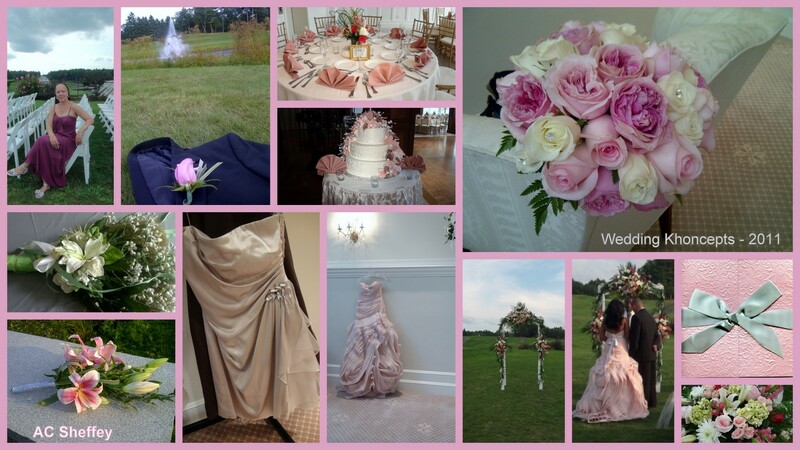 Congratulations to Krissy and Tommy on their September wedding celebration. 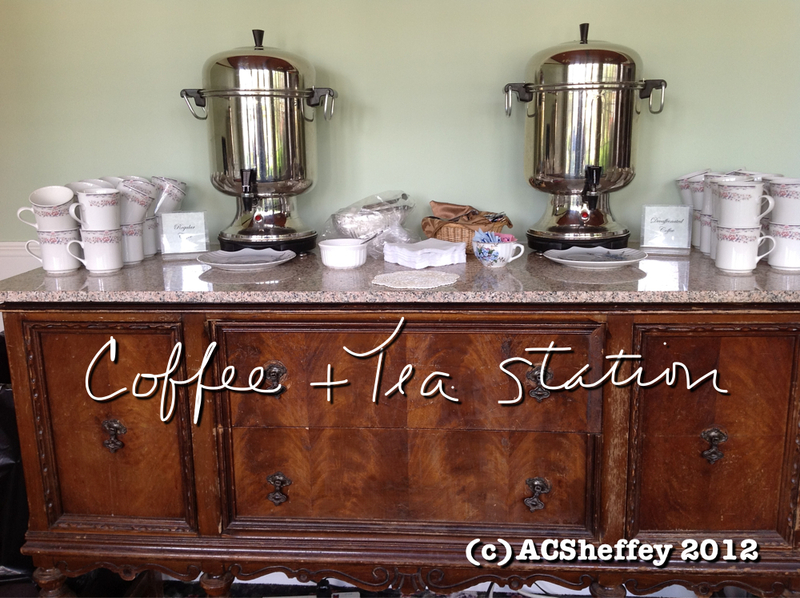 Their wedding reception room had a beautiful corner where both a water station and coffee/tea stations were set-up for guests to enjoy throughout the evening whenever they wished. What a super idea! 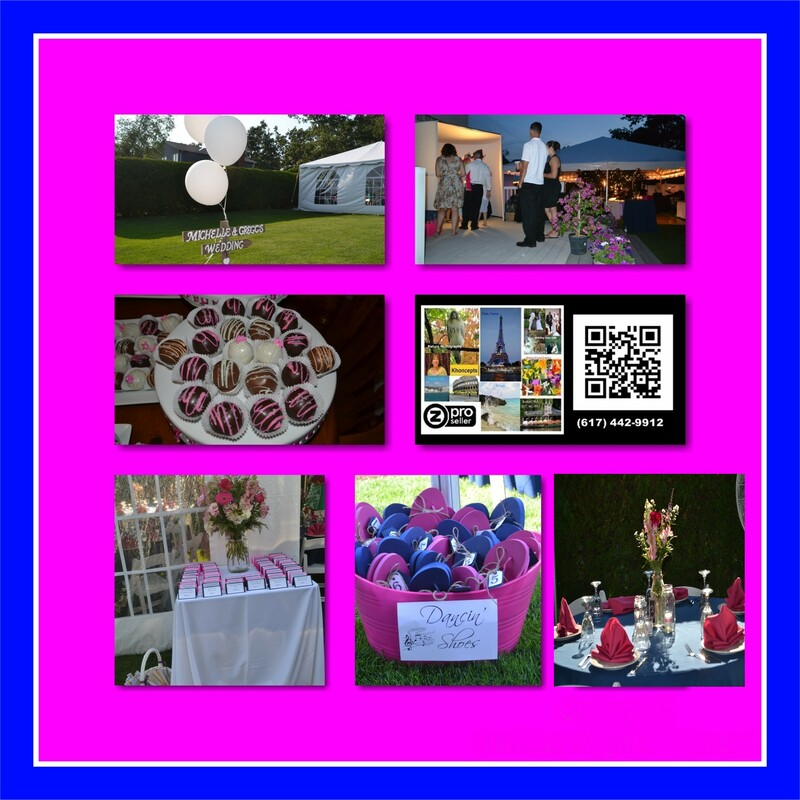 that was held under a huge white tent, with vibrantly decorated reception tables using the wedding colors of hot pink and royal blue. The landscaping beautifully complemented the wedding celebration, including amazing Koi fish pond, huge trees and tall sculpted privacy hedges. The DJ was a very good guitarist and singer whose company also provided a fun photo booth that was set-up on the large patio deck during the cocktail hour while the newly wedded couple took their formal wedding portraits. The entire day was fabulous. Dinner was a scrumptious buffet, my favorite type of meal and the cake-pops cooked and designed by the bride’s mother were tasty, it was impossible to eat just one. The evening ended with the guests lighting sparklers as the couple danced their last dance of the evening. As an extra special treat, we created a private, password protected webpage for our bridal couple which was ready when they returned from their honeymoon. They loved be able to view the entire first hour of their wedding day video online! Due to our upcoming vacation time, they will be so excited to receive all the raw footage of their wedding day several weeks ahead of schedule. 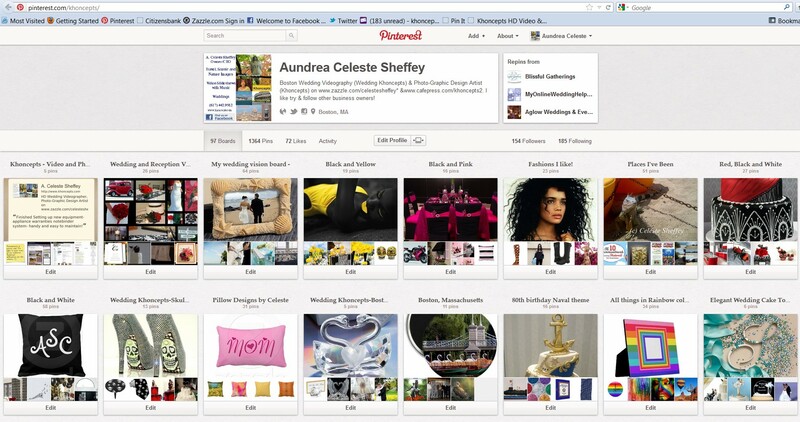 January 2012 was the first time I had read about Pinterest. All I could think of was yet another social media site to learn, master and grudgingly spend tons of time on trying to connect with possible clients and engage with my current clients. I continued to read about Pinterest and even set-up google alerts about Pinterest to see how it would benefit me as a scenic photographer and wedding videographer as well as my customers. I officially joined Pinterest on January 27, 2012 and thought ok, here we go. I named one of my first pinboards “Places I’ve been” and promptly uploaded a photo of a beach in Oahu which was immediately “re-pinned” and commented on by several people. As a photographer, I quickly learned my first mistake which was, “pinning” a photo without a watermark. Had I placed a watermark on the image first, everyone that copied it to their pinboards would have my business attached to the photo. The second lesson was learning to participate in pinning images that either had a web link to the original source or pinning user images. Pinning just a Google image without a verifiable sources is a no no. I’ve also found that Pinning my business images is fine and ok as long as I also Pin and comment on other images. It’s not all about me and what I do. As a visual artist and former collector of ripped out magazine pages on a variety of topics, Pinterest is a wonderful tool that appeals to me on so many levels. Especially being able to share colorful wedding themes with some of my wedding clients as well as links to helpful wedding planning sites. Visit my Pinboards and send me a link to yours! We recently videotaped a gorgeous wedding using our favorite three colors, black and white with red accents. 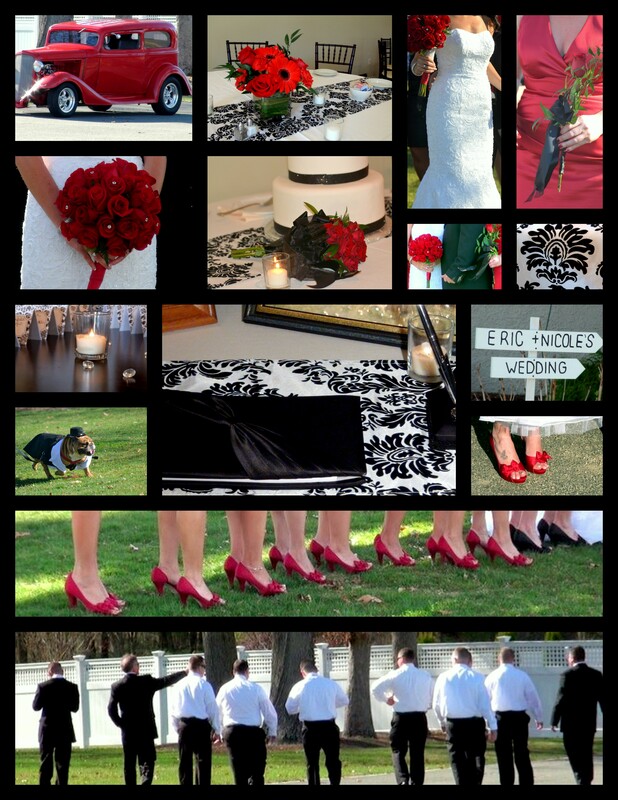 Red bridesmaids shoes, red limo car, red flowers, red maid of honor dresses. Stunning. The weather was absolutely perfect for outdoor wedding portraits taken in March. Comment and share with us, the colors of your wedding day celebration. 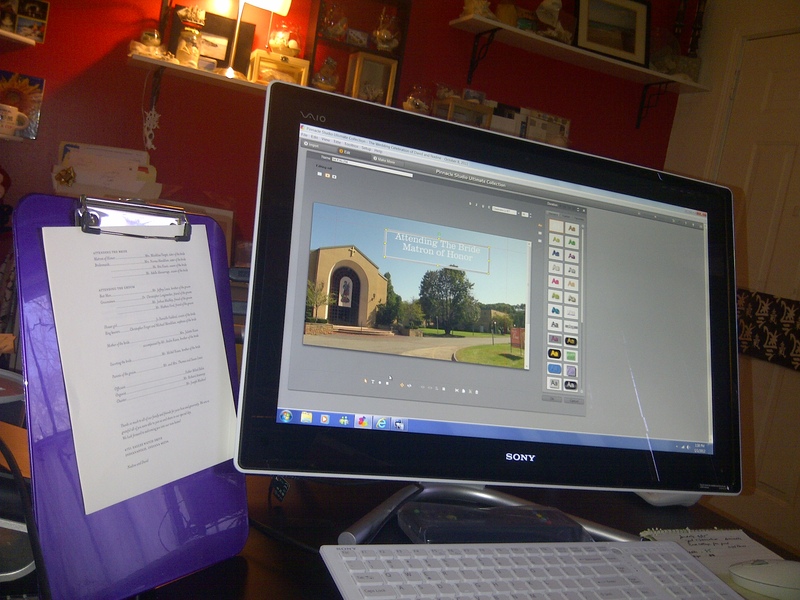 Wedding programs are a very integral part of my video editing process. I match the font and program layout as closely as possible, typing in all of the names of the wedding party in a really nice upward scroll feature. I’ve found that manually typing all of the information provided a much better result than scanning the program. Scanning tended to reduce the quality of the text making it hard to read on the DVD. Ultimately, Wedding Khoncepts goal is always provide high quality service for all our happy brides and grooms! My oldest son and his fiancee were married in August 2011, outdoors, at a very lovely country club. Although it was windy and a bit cloudy and overcast, we were thankful the weather held steady throughout the ceremony and portrait session as the bride had her heart set on an outdoor ceremony. At one point I even had to run interference with the event coordinator who wanted to move it inside. For 11 years, I’ve been the person videotaping the weddings. Their wedding was a major challenge as I now had to be, in front of the cameras. So here I am, again stepping out of my comfort zone, posing in my burgundy mother-in-law dress, chosen after trying on many many styles with the assistance of my 2 daughters, the bride’s two sisters and the bride. My granddaughter aka, 3rd assistant, kindly agreed to videotape the wedding ceremony. During the reception I happily videotaped the first 90 minutes of the reception as the bride groom were the only ones announced into the room. The rest of the time, the video camera was recording the reception while centered down onto the main floor. My son and new daughter’s wedding day was exquisite – dressed like a princess bride in her stunning customized Vera Want wedding gown with matching custom wedding invitation. Our families are thrilled as they journey into this new phase of their lives.